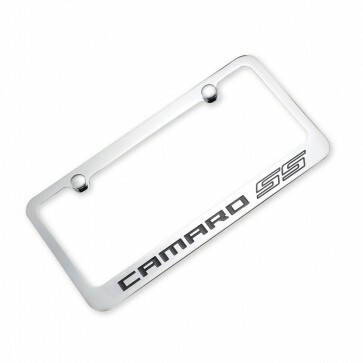 Add a little flash to your ride with one of our most popular Camaro accessories. This high quality, heavy solid brass frame will showcase your license plate in style. Your choice of Camaro logos engraved on the bottom of this mirror polished, chrome-plated frame and meticulously hand-painted with UV-rated enamel for long lasting beauty. Rust resistant. Mounting hardware included. Note: For use on rear license holder only. Does not fit the front license holder. Fits all 2010 to Present Camaro Coupes and Convertibles.